Tour Israel with Tom Trento & Dr. Roni Wexler! 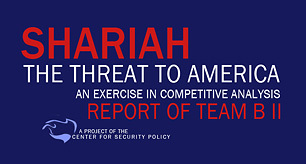 See Israel from a National Security and Biblical perspective. COME ON A FACT-FINDING EXPEDITION TO ISRAEL AND LEARN WHY BORDER WALLS, BARRIERS, AND FENCES WORK TO SECURE NATIONAL SOVEREIGNTY! ISRAEL 2019 – JERUSALEM DAY CELEBRATIONS! 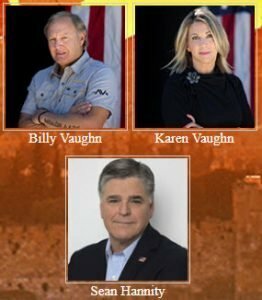 In addition to the exciting Jerusalem Day celebrations and our border wall expedition, we present a very solemn event with Gold Star Parents Karen and Billy Vaughn. The Vaughn’s will lead an inaugural Tree Planting Ceremony on the shore of the Jordan River in memory of their beloved son, Navy Seal Aaron Vaughn and the 30 American Heroes who perished with him in Afghanistan on August 6, 2011. Our unique and dignified ceremony includes a military color guard and VIPs from America and Israel. Join Team Jerusalem 2019 and many other friends and guests on this special Jerusalem Day Celebrations Tour. Partake in a unique Memorial Tree planting in the Jordan River and experience a fact-finding expedition with visits to cities and towns around the Gaza borders, Lebanon, the Golan Heights, Judea & Samaria. Along with substantial geopolitical information you will visit some of the most significant Biblical sites for Jews and Christians. Of course, there is considerable time for fun, relaxing and shopping! Please review all website sections. You can also call for more information: 561–582-1424. Reporting from the 2018 tour, as we made our way across Israel and saw some amazing places! May 3, 2018, David Ben-Gurion Airport: We are here, the adventure begins! May 10, 2018, Quneitra Pass, Israel: So what do you do when Israel is on “high-alert” because of Iranian rockets launched into the Golan Heights? You go to the Golan Heights, that’s what you do! Masada is an ancient fortress in southern Israel’s Judean Desert. It’s on a massive plateau overlooking the Dead Sea. A cable car and a long, winding path climb up to the fortifications, built around 30 B.C. Among the ruins are King Herod’s Palace, which sprawls over 3 rock terraces, and a Roman-style bathhouse with mosaic floors. 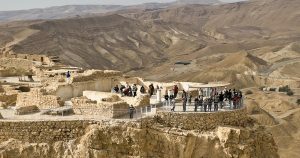 The Masada Museum has archaeological exhibits and recreations of historical scenes. Steps to the Dome of the Rock. 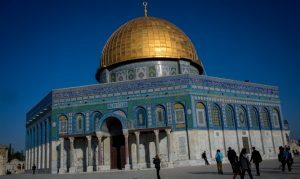 The Dome of the Rock is an Islamic shrine located on the Temple Mount in the Old City of Jerusalem. 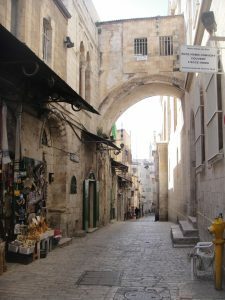 The Old City is a 0.9 square kilometers walled area within the modern city of Jerusalem. Until 1860, when the Jewish neighborhood Mishkenot Sha’ananim was established, this area constituted the entire city of Jerusalem. The US Embassy site in Jerusalem. 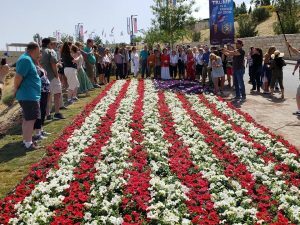 A US flag in a flower bed to show appreciation to President Trump. This video is from a 2015 visit to Israel, but our 2018 visit included this same location and we heard him speak again. What an interesting individual and great patriot for Israel! We learned so much from him that day! May 14, 2018 Jerusalem, Israel: I ran into Gov. Mike Huckabee at the US Embassy Celebration! Listen to his short statement on the US Embassy move to Jerusalem! The massive solid gold menorah displayed inside a transparent case in the Jewish Quarter, overlooking the stairs that lead down to the Western Wall plaza and the Temple Mount. 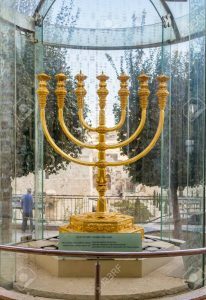 Not just a model of a menorah, it is made out of 45 kilograms of 24-karat pure gold and is valued at several million dollars. 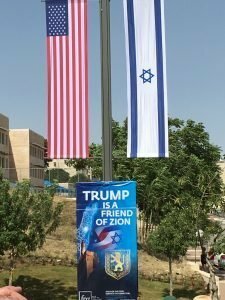 US Embassy site in Jerusalem with banners expressing THANKS to President Trump for the move. To see the full list of videos, place your cursor in the upper left corner of the video window and click on that icon for all of the videos available.